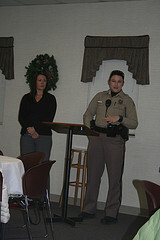 Officer Kimrey and Officer Long spoke about safety issues at Mom's Carelink on November 23, 2010. Both are assigned to the Community Policing unit in the Patrol West Bureau of Wichita. 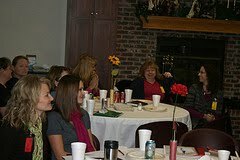 They shared a variety of safety tips including burn safety, theft, drownings, child safety and shopping tips. 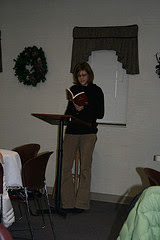 Here is a smattering of things they shared. never leave children unattended in the bathtub. Have gates on pools and alarms on the gates because kids do learn how to scale the fences. There are growing accident statistics involving small children falling into toilets and mop buckets and drowning. Teach children their names as early as possible, so they can tell someone their name if they get lost. Complete a Child Forensics Kit (pamphlet of information) for each child and keep with you because it will contain all the information needed to file a missing child report. Teach children to find a uniformed officer or identify an employee of the business to go to if they get lost or separated from you.